Have you found a designer wedding dress that is more than you budgeted for? Then consider looking at discount bridal gowns sold online. You receive actual designer bridal gowns, but at a substantial savings. Here are some FAQ. 1. How does buying discount gowns online work? There are bridal stores online that will sell the same gowns you see in your local bridal shop at a 10 to 30 percent discount off of the retail price! And no . . . they are not "knock offs" or gowns created to look similar to the top bridal designer gowns they are the real deal designer dresses. "I feel this is a good way to save money on a brand new designer wedding gown." I use to be a dealer for a company that offered brides the opportunity to buy bridal gowns at a discount. They were the exact designer dresses you could buy in the bridal shops, not copies. "I was able to save brides typically anywhere from $100 to $500 dollars on a gown. Now you can have savings like this too!" 2. I see a lot of websites selling bridal dresses for under $300, are these the type of sites you are talking about? 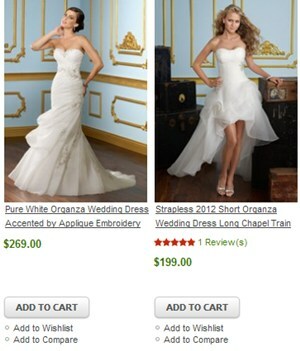 No they are not offering the same discount bridal gowns I'm suggesting here. Those are the sites that make "knock-off" or "replica dresses" which ship straight from China. They are not authentic designer gowns. The quality of the construction and materials are not up to the standard of designer bridal gowns. That is why they are much cheaper. They will not have designer labels on them when you receive them. 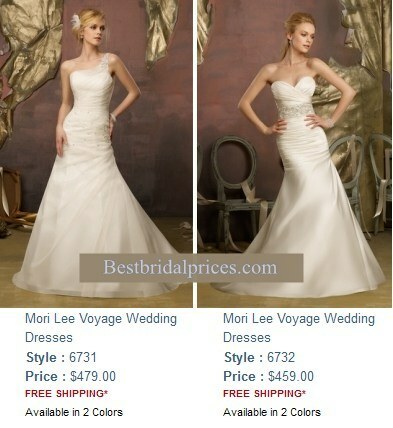 "This is a partial page from a website selling wedding dresses based in China. Most sites like this use pictures of designers' gowns without authorization and post descriptions instead of manufacturer names and style numbers for their products." 3. How can I identify which websites sell authentic designer discount bridal gowns? They will say on the website that they are "authorized dealers" and sell "authentic" designer wedding dresses. The website is not based off shore, and your gown will not ship from an off shore business but within the country. When you order you will need to give the designer's or manufacturer's name and the style number of your gown. It will be the same information you can get off of the designer's site. And when you receive your gown you will know that it's authentic because it will have the designers' label and tags on it. "Most discount bridal online stores that sell "authentic" designer bridal dresses show the designers name and style number for each gown as shown in the picture above." 4. So how do I go about selecting a dress? You will have to determine beforehand which styles look best on you. Whatever way you choose to do this is up to you but, once you make your selection you will need to have the designers' name, the style number and size you need. You can call some of the discounters to order by phone but most want you to order online. Read this article for more information on how to place a mistake free order when purchasing discount wedding gowns. 5. How can the wedding dress online stores afford to discount bridal gowns? Are they cutting corners somewhere? Some bridal shops operate both locally and online. On their they website discount the price of bridal gowns because of the high volume of orders they receive. Most online discount stores though, don't have an actual brick and mortar shop. They have accounts with the wedding dress designers. Once you place your order with them, they order your gown directly from the manufacturer at that time. Having less overhead expenses... these companies can pass on the savings to you. 6. How will I receive my gown? You will be given an approximate time of delivery according to your manufacturer or designers' timetable when you order. The gown is then shipped to the discounter where they inspect it and then it is shipped to you. It's pretty simple. And it has worked well for many brides. But if you still feel skeptical about ordering a discount bridal gown online... then this probably isn't the way for you to go about getting your wedding gown. Even though you will pay more... it's best to have piece of mind and purchase your gown with a local bridal shop. For more information on how to check out the reputation of a discounter before ordering a wedding dress online check out this article. Which online store is the best place to order discount bridal dresses? Here is my recommendation.